Fanch's paintings and graphic works can be characterized by the implied presence of participants, the order enhanced by color, and the distant view. According to art historian, Eleanor Hight, "The tremendous appeal of his art comes from the delicate balance, but underlying tension, between what is real and what is possible. His cheeriness, often exuberance, is balanced by both worldly knowledge and personal introspection." His paintings and lithographs from the 1970's and 1980's display characteristics often associated with "naïve" art. His views of Paris, a city which has embraced naïve art, display the attention to minute detail, the use of brightly-colored accents, and the disproportionate and simply rendered figures typical of a self-taught artist. His images of leisure activities—skating, riding in carriages, enjoying music in the park—are reminiscent of the subjects depicted by the French Impressionists. 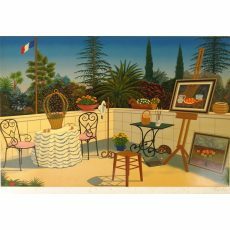 In the 80's Fanch turned to more brightly colored paintings and again a connection to Impressionism. He began to work on paintings that he refers to as "interiorscapes" or "interior visions." In the mid 1980's, he started to include paintings by modern masters in his interiors, as he says "to pay tribute and humble homage." While his work is inspired by collective memories of places he has seen, many interiors spring from the imagination rather than specific places. His love for the outdoors is depicted in his art by the often airy spaces. Eleanor Hight noted, "There is never a sense of being closed in; there is room to move inside and easy access to the exterior through open windows or doors to views of a city or the sea." When asked about his connection to the outdoors Fanch said, "I spent all my childhood vacations on the beautiful beaches of Brittany, and I am forever attracted to beaches and oceans and all the activities that are possible around them: diving, fishing, sailing, kayaking, surfing, swimming, and tanning. Overlooking the vast and inspiring ocean from my atelier, I constantly find peace and emotional renewal." A recent original print by Fanch Ledan offers a window onto this artist's world, a graceful synthesis of observed fact, artistic homage, and reverie. In Interior with Buddha, 2001, a serigraph from a painting that was done the previous year, we look down on an elegant room. Though no one is present except for us, the viewers, we can piece together the story of a life. Classical music played on a harp, reading while taking tea, appreciating antiques and the Spanish masters of modern art--Picasso and Miró. All is ordered by an underlying geometry—the square columns, the vertical strings of the harp, the pink and rose stripes of the upholstery. The colors, too, contribute to a sense of harmony and quiet. Intense hues of orange, yellow, and blue-green in the furniture and artwork are modulated by the softer complementaries of pinks and blues. While these details tell of a cultivated life in a grand interior, the image shows that the artist is equally concerned with other worlds. Taking a cue from the glasses left on a chair, we change our field of vision from near to far, either literally out the window to the sparkling cityscape at night or, as implied by the pink quartz Buddha elevated on its pedestal, spiritually to the sky above. A perfect world of comfort and art is juxtaposed with the infinite world of dreaming. The basic elements of this work—the high vantage point, the absent but implied presence of participants, the order enhanced by color, the distant view—characterize most of Fanch's mature work, both his paintings and his graphic works. The tremendous appeal of his art comes from the delicate balance, but underlying tension, between what is real and what is possible. His cheeriness, often exuberance, is balanced by both worldly knowledge and personal introspection. Fanch chooses from his meticulously rendered paintings, a relatively small yearly output of around 25-30 works, those images he will make into original prints. From the beginning of his career, he saw his greatest accomplishment to be the publishing his art so that it might be more broadly known. Over the last three decades, he has created a staggering number of limited editions, the 244 lithographs, serigraphs, and seriolithographs that are the focus of this book. The art created by François Ledan, known today primarily by his nickname Fanch, is inextricably tied to the events of his life. His identity as a Breton, his years studying, living, and working in the United States and France, his wanderlust—all have shaped his world view and thus his art. A closer look at the path he has traveled offers another window onto the world he creates through his paintings and his graphic art. Born in 1949 in Pontivy, Brittany, in northwestern France, Fanch was the youngest child of a doctor (his father) and a dentist (his mother). He was educated in local schools before furthering his undergraduate and graduate school studies in Paris. Though talented in mathematics and science, living in Paris drew his attention to the charms of the city and its famed art scene. By the time he earned his three bachelor's degrees in mathematics, science, and philosophy at the precocious age of nineteen, he had started to paint his first small paintings, street scenes of Paris. He had also commenced his life of constant travel with an excursion to Greece, Hungary, and Yugoslavia. At first Fanch followed the professional life chosen by his parents and siblings (his brother is an engineer and his sister an orthopedist). He studied business in Rennes, Brittany, and in Paris, where he obtained a master's degree from the École Supérieure des Sciences Commerciales Appliqués in 1972. During this time in Paris, he also met students at the École des Beaux-Arts and visited the major museums and galleries. Yet, Fanch longed to travel to the United States, and luckily his parents consented on the condition that he continue his studies. Thus, in 1972 he entered the Master of Business Administration program at Sacramento State University, where he obtained his degree the following year. The year 1973 was important, however, for another reason. Fanch decided to show some of his paintings to McInnes Bromfield, director of the Pantechnicon Gallery in San Francisco, and to his surprise he offered Fanch his first exhibition at the gallery. The next year this was followed by another show at the Pantechnicon Gallery, as well as exhibitions in Los Angeles, Laguna Beach, New York, and Milan. Suddenly, Fanch realized he could make his living by doing what he loved most, and what had only been an avocation up to this point—creating art.